Hey guys, so please please please excuse the horrendous photo ^ it was just a quick snap to show you guys something that I made. 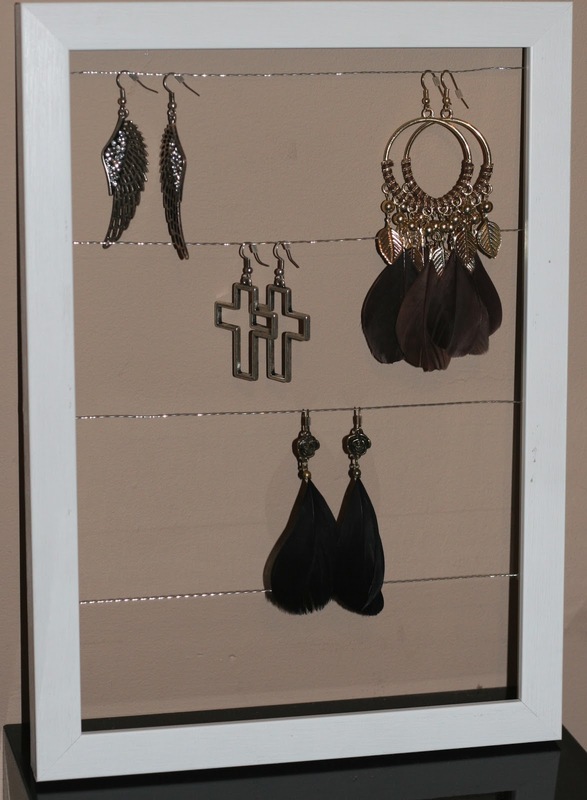 It’s a really mega cute and easy earring holder. I think it looks so pretty and unique and will look amazing on my dressing table! It’s so simple to so I’ll just run through very quickly how I made it. You start of by getting a photo frame, this could be any colour or any size, that is up to you. I got a white wooden one and I am going to shabby chic it to go with the rest of my room and just sand bits of it down etc. You then take the backing off so you are just left with the actual frame. Next, you need to buy some picture wire or something like that. I could only find copper coloured picture wire and I wanted silver so I went into Hobby Craft and bought some jewellery making wire stuff, it is silver plated and only cost a couple of quid. I then got two bits of wire, and clamped them with some tool. I kept twisting and twisting until the two bits were tightly twisted around each other. That part is also down to personal preference, do what you think works best. I then got a staple gun and just stapled it to the back of the frame, pulled it tight, and did it on the other side. I did 4 rows, but depending on the dangle on your earrings/the size of your frame you could do whatever or however many you would like.